Japan’s biggest online shopping mall Rakuten (nearly 50 million registered users in Japan/Asiajin articles) today announced [JP] a capital and business alliance with Bangkok-based Tarad Dot Com [TH], Thailand’s leading e-commerce company. The move marks Rakuten’s first serious attempt to gain in a foothold in the country, which has an Internet population of 13.5 million people (data from May 2008). Before today, the Japanese behemoth’s business activities in that country were limited to running a Rakuten Travel Thailand office in Bangkok. Rakuten invested about 300 million Yen (3.35 million USD/2.3 million EURO) to buy 67% from Tarad. 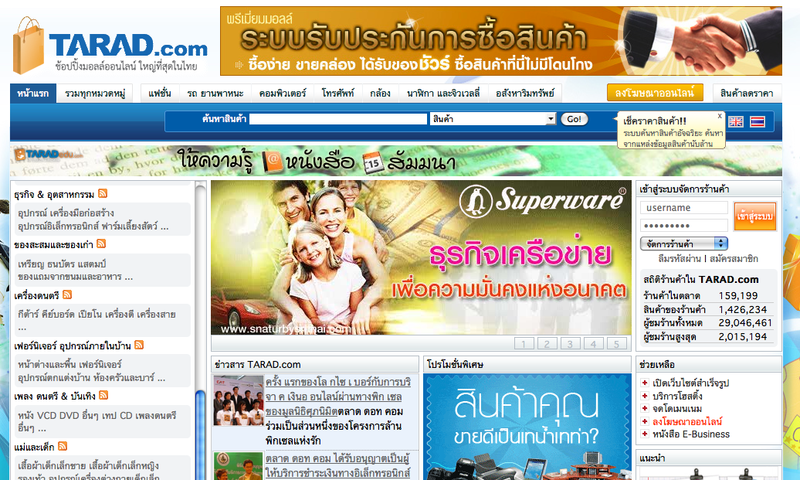 Around 160,000 merchants are currently registered at the Thai service. 2 million people are registered as customers. Rakuten says it will send three executives to Thailand, one of whom will serve as the CEO. Tarad was founded in 1999 and has just 42 employees, which is quite amazing (Rakuten: 5,600 employees).